I got a new Mark Bittman cookbook recently, which makes me the rare woman looking forward to cooking this week. My first cookbook of his, How to Cook Everything Vegetarian, is so full of chometz, it’s not even worth cleaning. I use it several times a day. My friend, Eve, had delivered the book as a baby gift last Pesach, and I read it cover to cover on Yom Tov. Eve’s also the one who recommended my new cookbook, How to Cook Everything. I learned a lot of things from Bittman this year, but if there’s one important lesson to help with Pesach cooking, it’s that just about every vegetable tastes totally awesome roasted with some olive oil, freshly ground pepper and kosher salt. Kohlrabi, whole carrots, long slices of zucchini, root vegetables, garlic, onions, peppers–the possibilities are endless. 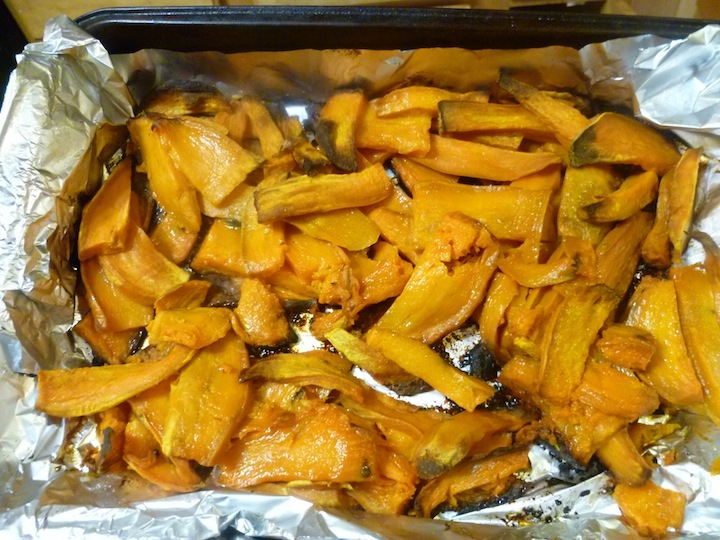 If this pan looks sparse, it's because I was stuffing the hot, crispy sweet potatoes into my mouth. I’m with you. 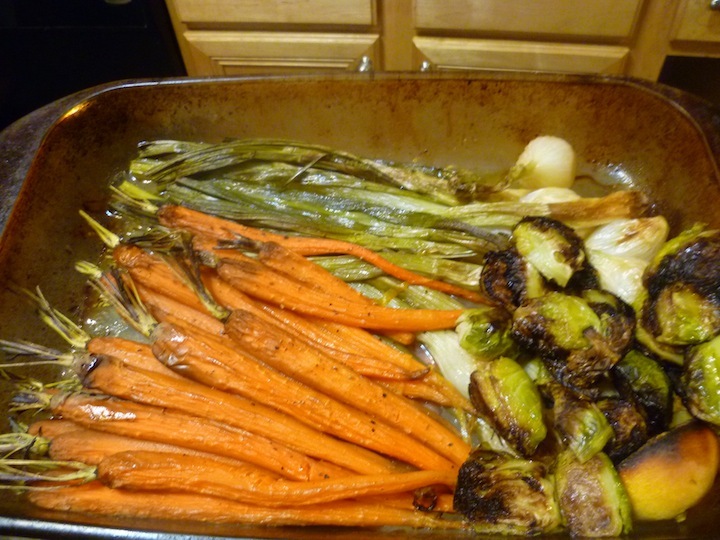 I love roasted vegies. BTW I saw a tip on thekosherblogger (Margo Sugarman’s blog) . She roasts red onions and then adds them to a salad of baby greens. I suspect you could do the same with the vegies you roasted, if you have any leftovers–a big question because I usually end up eating tons whenever I make them. Why shouldn’t you be in the kitchen this week? I’m feeling a bit kitchen sick –not sick of the kitchen but homesick for the kitchen because we won’t be making Pesach at home and there are so many things I’m itching to try. Thanks for the tip! I usually have to restrain myself from eating the veggies straight from the oven so that there will be enough “leftovers” for the meal!